﻿ John Chapter 02. What is the Covenant that God made with Abraham and confirmed in Christ? churchages.net » English » Bible Studies to help you » John Chapter 02. What is the Covenant that God made with Abraham and confirmed in Christ? Jesus, being God in the flesh, looks at human events as a type or shadow or symbol of a much deeper spiritual reality. Thus John's Gospel enables us to see how God views our small earthly events in terms of His Big Picture that He alone can see. “Galilee” can be derived from the word for “circle”. Drawing a circle allows one’s pen to go around the same path more than once. Thus a physical event in the Old Testament can also illustrate some characteristic of Christ's ministry and of His future church. For instance, the physical actions of a woman represents the spiritual state of the church. Since a woman is symbolic of a church. Christ sees His church as His Bride. Adam's bride was called Woman ( because she was taken out of man ) until she fell into sin and became the mother of all living. Then she took on a man-made name Eve. What does this represent in the Big Picture of God? The believers in the early New Testament church were called Christians, because they belonged to Christ and His Word only. The Bible is the Word. Then in 325 AD the emperor Constantine gave political power to the Roman Catholic church. The man-made name "Roman Catholic" showed that they had fallen away from Scripture. This denominational church rose in power and authority as it combined religious deception, political power and enormous wealth until she called herself the mother church as she gave birth to the Protestant and non-Protestant denominations and non-denominational churches. The Roman Catholics put a man in charge of a church. They introduced words and ideas that are not in the Bible. Denomination is unscriptural. So is Trinity. So is Christmas and the Christmas tree. So is archbishop, cardinal, and Pope. The early New Testament believers never had a pastor in charge of a church. The word pastor is only mentioned once in the New Testament, although it is condemned six times in the Old Testament. The New Testament never says that a shepherd is a pastor. That is a man-made idea. So, by taking on man-made names like Methodist, Baptist, Anglican, Greek Orthodox, etc. the churches were just indicating that they had fallen into sin and unbelief because they believe in unscriptural words and ideas. A harlot is a woman who is unfaithful to her husband. This is a symbol of a church that does not stay strictly with the Bible. Jesus, the Word of God is the church's Husband. He is the Bible. Just the way it is written. We belong to Him as Christians and we must stay faithful only to Him. Roman Catholics refer to themselves as the mother church. The Catholic church developed a business orientated money-making focus based on religious profits. For efficiency, they developed a priest or pastor-dominated church. They went outside the Bible to introduce an unscriptural Trinity. Thus they have no single name for their God as He consists of three separate People. Political involvement made then famous. These are just an example of some of the beliefs and methods of the Roman Catholic church that other churches follow, making them the copy-cat daughter churches of Rome. Rome has a supreme church image as a worldwide, wealthy, and politically important survivor that has endured endless turmoil for about 1 900 years. Thus her business and marketing skills and methods set the example that other churches are keen to copy, even when there are doctrinal differences. Business is based on name brands like Coke, Apple, Google, Nike. Rome has developed Saint Peter as the doorkeeper to Heaven, Mary as the sympathetic mother you can pray to as well as other saints. Pope John Paul II, mother Theresa, and Pope Francis have become world-wide respected and famous name brands for the Roman church. The combined wealth of all the Catholics is staggering. Non-Catholics are now also pushing their famous religious name brands like TD Jakes, Joseph Prince, Oprah Winfrey, and Joel Osteen. As is the mother, so is the daughter. These name brands are worth billions of dollars. Knowing that the churches would fall away from the Bible, Jesus begins His ministry by establishing certain key requirements that the church must follow in order not to be led astray by clever man-made ideas and lucrative business practices. In Revelation Chapter 1 Jesus calls Himself Alpha and Omega, the First and the Last. The first miracle Jesus did was to transform water into wine at a wedding feast in Cana. The last miracle involving the true church which will be performed by Jesus will be the transforming of the mortal bodies of His living church into glorified bodies so that they can be caught up to Heaven to go to the wedding feast in Heaven. Cana is sometimes taken to mean “a place of reeds” as there are nearby marshy places with reeds growing. :2 But the court which is without the temple leave out, and measure it not; for it is given unto the Gentiles: and the holy city shall they tread under foot forty and two months. The reed speaks of measurement. Here the measurements of length are not mentioned but the emphasis is placed on a time measurement of three and a half years. The reed which is a symbol of measurement now indicates that God has measured out a specific time span for the Jews. What is symbolized by not measuring the outer court of the Gentiles? We do not know the length of time allocated to the Gentiles. We do not know when the Lord will come to end the Laodicean church age. Various Christians have guessed 1844, 1914, 1975, 2013 and always got it wrong. Message believers guessed 1970, 1977, 2000 and also always got it wrong. Dating is not marriage. Christians who are obsessed with dates are obviously not married to Jesus. The holy city of Jerusalem belongs to the Jews. “Holy” implies that God is helping them ( because only God is holy ) when they are trodden under in this three and a half year Tribulation. So when the church is caught up to Heaven for the marriage of the Lamb, then the three and a half year Tribulation starts for the Jews ( and all the Gentiles who stay behind ). 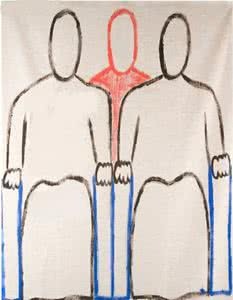 The witnesses are the Jewish prophets Moses and Elijah. To enable these two prophecies to cover the same length of time, Bible prophecy has to work in months of 30 days. Compare this with the dates of Noah’s Flood. GENESIS 8: 4 And the ark rested in the seventh month, on the seventeenth day of the month, upon the mountains of Ararat. From the 17th of the second to the 17th of the seventh month is five months. That is equal to 150 days. Again, 30 days makes one prophetic month. So "Cana", which implies measurement with "reeds", is used to measure the time length of an important prophecy concerning Messiah's ministry. Jesus should have had a seven year ministry with the Jews. Around the start of His ministry, Jesus is called to a marriage in Cana. So the clock starts ticking and history records that in three and a half years time he will be crucified at Calvary. Thus, because He is rejected by the Jews, who are God’s stopwatch, prophetic time stops for Israel at Calvary. So the Jews only received half the time they were promised. When the church is caught up to the Marriage supper of the Lamb, the stop watch clicks again and prophetic time continues as God turns back to the Jews for the final three and a half years of the great Tribulation ( that is then added to the three and a half years of the ministry of Jesus ). This explains a vital prophecy that the churches really get wrong today. Jesus should have had a seven year ministry. His ministry was actually three and a half years because He was rejected and killed in the midst of the seven years. When He died on the cross, God tore up the Temple veil. That ended the Jewish Law and its sacrifices. Unwilling to admit this the Jews sewed up the veil and limped on with meaningless ceremonies because God had left the Temple in 33 AD when Jesus died. Then God got the Romans to destroy the Temple in 70 AD. Now everyone realized that the sacrifices had stopped. John the Baptist was the messenger of the Covenant. God made the Covenant with Abraham and confirmed it in Christ at Calvary. So John introduced Jesus as the One Who would confirm the Covenant. A week can be used to describe seven years. The churches claim that the antichrist will make a seven year covenant with Israel. Not true. Fake news. The covenant is confirmed, so when is it made? And what is the covenant, in Scripture, that this prophecy refers to? It is not the antichrist who confirms the covenant, it is God Who confirms the covenant. So when did God make the covenant? God made a covenant with Abraham in Genesis Chapter 15. At first it seemed that the covenant was just to give Abraham the Promised Land of Israel. God intended the Promised Land to pass to Isaac and then to his descendants, the Jews. The river of Egypt is difficult to track down accurately. It is not the Nile because Goshen was between the Nile and the Sinai desert. If the Nile was the river of Egypt, then the Jews in Goshen were already in the Promised Land when Moses came. 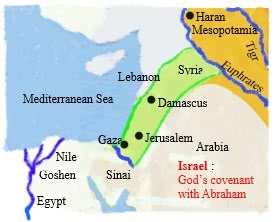 Gaza, the west bank, part of Jordan, and a big chunk of Syria are all part of God’s gift to Abraham. But the covenant had much deeper implications than that. Paul makes a big distinction by stating that the covenant actually refers to Jesus, rather than to the Jews. But Jesus is the Word of God. So God is making a covenant according to His Word. Galilee brings up the idea of a circle that repeats. Going around once with the 2 000 years of history of the Jews in the Promised Land and then going around again with the sacrifice of Jesus on Calvary which then leads on to another cycle that is the history of the born again believers in the church ages that lasted 2 000 years. The middle of seven years is three and a half years. Jesus had a ministry of three and a half years. His death ended the value of the Temple sacrifices. The blood of those animals could cover sin by getting it forgiven. But those sacrifices could not take away the desire to sin. His death produced Blood that could wash away sin and released the Holy Ghost that was in His veins so that the Holy Ghost could come back to dwell in repentant human hearts and take away our desire to sin. So the Old Testament sacrifices stopped. But how did this confirm the Covenant that God made with Abraham? "The promise". The Jews were given a Promised Land. The promise of the Christians is the Holy Ghost. The land of the Christians is the Word of God. A Christian only believes and lives by the Bible. The Bible puts limits on our behaviour and our thinking in the same way that God put limits on the territory of the Promised Land of Israel. The stars cannot be numbered. There are too many of them. So there will be millions of Jews during human history. But this sentence has a much deeper meaning for the born again church. This means that Abraham’s seed cannot be numbered with the mark of the beast. This number is 666. What does it basically mean? We get a clue from John Chapter 6: 66. Many of His disciples stopped following Jesus. Rejecting the revealed Word of God is the basic step that leads to people taking on the mark of the beast. Do not argue with or contradict the Bible. Just believe what is written in the Word. Speaking of the belief of Abraham, God called his faith righteousness. ROMANS 1:17 : as it is written, The just shall live by faith. Believing in God by having faith in Him is what God requires of us, as that will make us believe the written Bible. So the deeper meaning of the covenant involves Jesus the faith Son of Abraham, rather than Isaac who was the natural son of Abraham. So God called Abraham out of the Babylonian territory that occupied the area around the Euphrates and Tigris rivers. The Babylonians and Egyptians were the nations where the trinity doctrine started and then spread to the east in India. 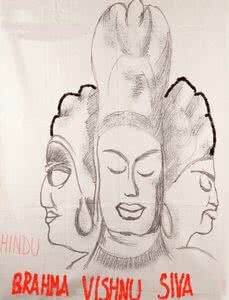 The diagram shows the Hindu attempt to describe one god in three persons. 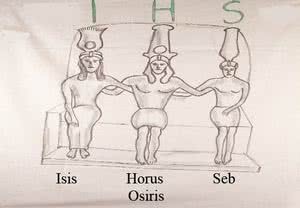 This diagram shows the Egyptian attempt to illustrate the trinity of three persons. Not very different to modern day church beliefs. Now God was going to make His covenant. He said, "Go get me a heifer of three years old." Watch, three. Everything in the Bible is a three. Three blends to a one. See? Father, Son, Holy Spirit, not three Gods: One. Faith, hope, and charity, not three different things, but all the essence of one: love. Now, then there was justification, sanctification, the baptism of the Holy Ghost, not three different dispensations, not three works of grace, but one work in three different manifestations. Same Holy Spirit was with Luther, under justification was under Wesley with sanctification; in the Church now, in the baptism of the Holy Ghost: the same Holy Spirit, not two Holy Spirits, the same Holy Spirit. …….. everything must be three years old, the three different dispensations: fatherhood, sonship, Holy Spirit. He cut each animal in half, representing the Old Testament and the New Testament. The turtle dove and the pigeon were not cut in half or separated into two parts. They represent salvation and healing. These are two benefits from Calvary that cannot be separated. If you can get salvation, you can also get healing. God was making the Covenant with Abraham but He was going to confirm the covenant on Calvary where the covenant came to reality. Not just the Promised Land of Israel but eternal Life in a New Heaven and a New Earth. The spiritual seed of Abraham is the born again Christians. Our Promise is the Holy Ghost. Our Land that we dwell in is the revealed Word of God. Now, he cut the heifer, and the goats, and things apart, and laid the pieces, one against another one, showing that they'd dovetail from one dispensation to another. The two pieces of each beast represent that the Old Testament and the New Testament which combine together to tell the same story. They also represent the Physical and Spiritual manifestations of God. At Calvary the Holy Spirit was torn out of the sacrificial Body of Jesus. The Bible becomes a new Book to you if you're ever in Palestine and in the Orient, the eastern country. It's a eastern Book. It's just a new Book when you see it in the light of the eastern people. And in this day how a covenant was made, what they did, they they taken a beast and killed it. They killed the beast, and they wrote the covenant out on paper or a lamb's skin, wrote it out on here, and they took that, tore it apart up over this dead beast's body. One men took one piece, one men took the other one, and took an oath to God, that if they broke this covenant between them, let their body be like this dead beast. What a binding covenant. And that's how that God confirmed the oath to Abraham. …….. Now, look, when Christ was on earth, the Son of God, which Isaac the promised one of the child, how'd he know he was going to have it? He was speaking to him what He was going to do by the killing of these sacrificial beasts, speaking of Christ. And brother, the only way in the world that the covenant will ever be keeped, or be kept, is when you and I receive the baptism of the Holy Ghost that God tore Christ apart and sent the Holy Ghost down for you and I. The only way we'll be able to go up in the rapture is when that body comes to receive the Spirit again, the raptured people that's in the covenant. And the covenant is the circumcision by the baptism of the Holy Ghost, that's Abraham's seed. Amen. Whew. I feel like shouting myself. My. God made the promise, and He tore Christ apart at Calvary. And on Pentecost, He sent the baptism of the Holy Ghost, and the Spirit that was in Christ is in you and you're a new creature. "And the works," Christ said, "that I do shall you do also; even to the end of the world I'll be with you." Hallelujah. And at Calvary, several hundred years later, He took His Son, and tore His body apart, His soul and body, and lifted up His body and set it on His right hand, and sent the Holy Spirit to the Church to continue the works of the Lord Jesus till He come. And He writes the covenant... In the Old Testament back in the holiest of holies, the commandments was wrote on tables of stone. But He said, "After these days that I will pour out My Spirit, and I'll write My covenant upon the tables of their heart, and in their mind." Amen. You see It? Then God, by the Holy Spirit, confessed faith in Christ, brings the Holy Spirit that writes the covenant of peace across your heart. Then the Spirit that was in Christ dwells in you, and It makes you act the Christ-like life. And in there, God has placed in this group of people, which is called his Body: apostles, prophets, teachers, evangelists, pastors. The real aim of the Covenant was to take the Holy Spirit that was torn out of Christ at Calvary and send that Holy Spirit back down into the hearts of repentant men and women so that they could live Christ-like lives. What do the fowls mean? :4 And it came to pass, as he sowed, some fell by the way side, and the fowls of the air came and devoured it up. So Satan causes people to reject the Word of God. This is the same principle that leads to the mark of the beast. But Abram was a believer in the Word of God. That is why he could not tolerate the fowls who were people that rejected parts of the Bible as being unimportant or irrelevant or wrong. MATTHEW 24: 28 For wheresoever the carcase is, there will the eagles be gathered together. Fresh meat or doctrine is presented to each age. Those who fall away and reject the revealed Scripture actually re-crucify Jesus. But the true believers, the eagles, want that rejected, revealed Word of our day that the others are condemning. We are warned. There is a hatred toward the revelation of the true Word for our day. Believe the truth and you are not wanted. God now puts Abraham to sleep to show that he has got nothing to do with the covenant. It is a covenant of Grace. The covenant depends entirely on what God does. Boaz redeemed Ruth. All Ruth could do was sleep at his feet and wait until Boaz acted out the part of the kinsman redeemer. He had to kick off his shoe. Jesus had to kick off all His glory in Heaven and come down to be born to an obscure mother in a smelly stable. He even had to carry the tag of being illegitimate as Mary went to Elizabeth for three months before getting married to Joseph. The true path is not necessarily the easiest path. Now, notice what he did. Then He said, "Abraham, I'm taking you out of the picture. You have no more to do with this at all." And Abraham went to sleep. And when he did, the first thing he saw before him was a real black darkness: death that faces every person. "It was once appointed unto men to die and after this the judgment." A hard darkness, hard, shaky, he had a horror. A darkness come before Abraham. But after that, he looked and he saw a smoking furnace. Every sinner deserves to go to hell. God's confirming His covenant now... Watch. And then after the smoking furnace, he saw a little white Light: salvation. And this little white Light went up to these beasts and went right in between each one of these beasts, making the confirmation of the covenant with Abraham, this little white Light. What was he speaking of? In a symbol if you're spiritual minded, you'll pick it up right quick. It was Christ he was speaking of. Every one of those animals, every one of those birds, them beasts, everything spoke of Christ at Calvary. Now, let me get it to you a little bit so you can understand it. So death comes first. Then hell was the next, the smoking furnace. Then he saw a burning Lamp, a Light. Now, watch. And this Lamp went between each one of those pieces, making a covenant, that God, someday through the promised seed would raise up the Lord Jesus Christ to confirm the covenant with all the peoples of the earth, which Abraham was a father of nations. Notice, He changed his name after that from Abram to Abraham. The two halves of the animals represent the Old Testament and the New Testament. Jesus came between the two Testaments. The four Gospels act as a link between the two Testaments. When He died He went down to the dark regions of Hell and His Holy Ghost was the burning Lamp that took the keys of death and hell from Satan. He dumped our sin on Satan and passed between the two Testaments to make sure that all was Scriptural and thus ensured that our salvation from hell was confirmed. Abraham’s literal seed were the Jews who would be slaves in Egypt until released by Moses. Abraham’s spiritual seed, the born again believers in the church ages, would be captive in the denominational traditions of the churches until the seventh angel came to reveal the written mysteries of the Bible. Dad, you may be old, and mother, you may be old, but I'll give you the promise out of God's Word, in the resurrection you'll be young again. And I'll give you the promise of God's Word, you'll never be an Angel. You're going to be a human. God made you a human, not to destroy you, but to raise you up. Sin made the destruction, but Life makes you eternal. You'll never be an Angel. You'll... If God had wanted you to be an Angel, He'd have made you an Angel. He wanted you a man and woman, so He made you one. So He took His son, made Him a form of sinful flesh and took Him up to Calvary (Listen close now. ), Took Him to Calvary and there God wrote His covenant with the human race. Oh, brother, see it. He took the Lord Jesus, the Emancipator of this proclamation, and He took Him to Calvary, and He ripped Him apart. He took the body up to heaven, set it on the throne and sent the other part down, which is the Holy Ghost. And that same Holy Ghost is here on the earth, making up the body of Christ. And at the resurrection, they'll have to be the same genuine Holy Ghost that fell on the day of Pentecost, that was in Christ Jesus will have to be in the church to come into that covenant, and then you're Abraham's seed and are heirs of all things! Amen. God swore that He would do it. He made His promise He would do it. He gave a covenant He would do it. He raised Christ from the dead to prove He would do it. He sent the Holy Ghost down to continue the same work that Jesus did when He was on earth to prove to you that we have nothing to be scared about. Cana seems to be a place where events occur that have significant spiritual value. The sign of Messiah is to reveal the thoughts of the hearts and thus be able to see across space and time. Jesus first demonstrated this Messianic sign to Nathanael, who was a Jew, and who came from Cana. :48 Nathanael saith unto him, Whence knowest thou me? Jesus answered and said unto him, Before that Philip called thee, when thou wast under the fig tree, I saw thee. :49 Nathanael answered and saith unto him, Rabbi, thou art the Son of God; thou art the King of Israel. Jesus knew Nathanael’s motives and saw him far away in the past and knew that Philip would call him later. Nathanael then acknowledged that Jesus was the promised King because He could see across a big distance and also see back in time. He could even see the motives of the heart. John presents Jesus as the flying Eagle, which represents God. Thus John looks at the current events in terms of the Big Picture which is the 2 000 years of Church history. In the first church age the apostles set up the church in the way that God wanted. The knowledge of the early church was mainly lost in the Dark Ages as domineering human leadership took over. Then came three church ages of restoration. In 1520 Martin Luther in Germany led the Reformation of the Sardis church age by restoring the doctrine that we are saved by faith and not by works. This was the first age or the first “day” of restoration. Around 1750 John Wesley in England led the Philadelphian church age when he restored the need to live a holy life and do outreach. This led to the famous missionary age that began about 1790. This was the second age ( or the second “day” ) of restoration back to the beliefs of the original New Testament church. The third age of restoration, the Laodicean church age, had two stages. In 1904 there was a Welsh revival and then in 1906 there was the famous four year Azusa Street revival in Los Angeles that restored back the supernatural power of the Holy Ghost baptism. Then between 1947 and 1965 William Branham in America sought to restore us back to the written mysteries that had been revealed to the first church age but lost during the Dark Ages. These mysteries had not been properly understood by the earlier reformers. Thus, being now at the end of the Laodicean church age, we are in the third “day” of the restoration of the New Testament truths. Our responsibility is to get the revelation of the mysteries that are written in the Bible. The final evidence of the Holy Ghost baptism is to reveal the written mysteries in the Bible as we are restored back to the early church. Sardis, Philadelphia, Laodicea. The three ages of restoration back to the New Testament church. At the end of the third age of restoration ( the third “day”) the church will be called up to Heaven for the marriage of the Lamb and His Bride. The Roman Catholic church is described as being the mother of harlots, which are the Protestant and non-Catholic denominations and non-denominational churches. The very word denomination is unscriptural and disqualifies them from being Scriptural. All the rest of the churches, who do not take brother Branham's quotes back to Scripture, will not understand the revealed mysteries. Those Christians will dismiss the deeper revelations as irrelevant or not important. They will thus not be able to understand many Scriptures, like why Jesus twice wrote with His finger in the ground when questioned about a sinful woman who was to be stoned. Therefore they will continue to cling to their wrong doctrines and their ignorance. A woman symbolizes a church as the true church is called the Bride of Christ. Mary symbolizes the early church of the New Testament in the Ephesian church age that ended around 170 AD. This early church would carry the Word of God, even as Mary had once carried Jesus. John never calls her by her name. Why? John always has a deep spiritual viewpoint. The true church should just be called disciples or Christians. No church should take on a man-made name like Roman Catholic, Lutheran, Methodist, Pentecostal, Message believers etc. The first church never did this. They were simply Christians, Christ-like. The first woman only got her name Eve after she had sinned. As soon as Christians take on some church name, it means that they have fallen into sin or unbelief. Knowing that the first church would only be called Christians, John does not call the mother of Jesus by a name. At the beginning of the first church age, no church had a name. This also indicates that the first age church is the mother church that later Christians should try to imitate. The Roman Catholic church claims to be the mother church but they only began to acquire their power and wealth after the Nicene Council in 325 AD. The first church that started with the apostles is actually the mother church. This fifth commandment tells children to honour their parents. But it also has a deeper spiritual meaning. We must turn back to the apostolic fathers who wrote the New Testament. We must be restored to the beliefs of the first church which is the true mother church. This will give us a long life as the dead Christians will rise and the living will be given glorified bodies that will never die. Together we will live for eternity on planet earth with Jesus. That is certainly a long life. The end time church must thus be restored back to the Bible beliefs and behaviour of the early church. A corn seed is planted and then, after going through certain stages produces an identical seed for the harvest. The last miracle that Jesus performs is to change His Bride into glorified bodies and summon them to the wedding supper in Heaven. So His first miracle was also performed at a wedding. :8 And to her was granted that she should be arrayed in fine linen, clean and white: for the fine linen is the righteousness of saints. :9 And he saith unto me, Write, Blessed are they which are called unto the marriage supper of the Lamb. A woman is the symbol of a church. The end time Bride, the true church, has to prepare herself for the marriage to Jesus in Heaven. No-one can just go to that wedding. Each individual has to be called. We all wait for that midnight cry. Until then, all the churches, the wise and foolish virgins, are asleep in their human traditions. Virgins are clean women, representing saved Christians. Fast asleep in their complacency and self-justifying church systems. A cry from outside the churches is needed to wake the churches up to reality and force them to cast off all their human traditions that so engross them. "Go ye out"". Whatever church you are in is not going to get you prepared. You will have to go out to meet the Lord. The resurrection will occur with the voice of the archangel. This cry of this voice will wake up the churches. William Branham’s message was the shout to reveal the written mysteries in the Bible that will enable the Bride to prepare herself for the Coming of the Lord by being restored back to the first church. But even that will not wake the church up. Now, that's what's the reason today that the revivals that we're supposed to have. We have denominational revivals; we haven't had a real stirring. No, no, no, no. No, sir. Don't think we got revivals. We haven't. Oh, they've got millions and millions and millions of church members, but not a revival nowhere. No, no. After the shout, which is the message going forth, then we have the voice of the archangel as He comes down to stand on land and sea and claim the dead that have been buried there. This happens when the Book has been opened. It is after the mysteries have been revealed. REVLATION 10: 3 And cried with a loud voice, as when a lion roareth: and when he had cried, seven thunders uttered their voices. Both expressions “cried with a loud voice” and “when he had cried” refer to the resurrection of the dead. 64-0119 SHALOM But, remember, if it goes plumb into the shadows of death, "I am the resurrection and Life; I'll raise him up again." And when the great Director comes down and bears that stick down, then, "time shall be no more." When that Angel, of Revelation the 10th chapter, puts one foot on land and one on the sea, and a rainbow over His head, He swore, "time shall be no more." When that time comes, you'll rise up from among the dead. While the rest of them lay there, you'll go in. So the mighty Angel of Revelation Chapter 10 is the Archangel that raises the dead. The lion’s roar of triumph as the Lion of Judah raises the dead to win that great victory over Satan. Then seven Thunders utter which will show the Bride how to receive rapturing faith. First the resurrection. Then the bodies of the living Bride change into immortal bodies at the time of the seven Thunders. Then the Trump of God to call them up to the wedding feast. ( Having Trump as president means everyone is talking about Trump. This is a sign of the times and is a warning to us that the time of the Trump of God is at hand. President Trump has spread a lot of alarm and things are very different to what people expected. This is a warning that we must learn to expect the unexpected ). At His first Coming, Jesus came in a very different way to what people expected of the Messiah. Joseph and Mary were unknown people. Nazareth was a bad place. People claimed Jesus was illegitimate because Mary conceived and then went to Elizabeth for 3 months before getting married. So the second Coming of Jesus is going to be very different to what we imagine. We need to be on our toes and searching the Bible. Let us look at the first marriage in Cana to get some clues that we can expect for the last marriage of the Lamb in Heaven. The disciples of John the Baptist were not invited, only the disciples of Jesus. The disciples of William Branham will not be invited, only the disciples of Jesus Who is the Word of God. No one went to the marriage unless they were called. "After this". After the church ages were over John was called up to Heaven at the end of the church ages. We only go up if God calls us. Jesus is the full Word of God. Only those who believe in the fully restored Word will be invited to the wedding supper of the Lamb. These are the true disciples who base their beliefs on Scripture. We must be careful. God calls us through His Word. If we do not understand the Bible we will simply stay with our church traditions and opinions and ignore the revealed Scriptures. Then we will not be invited to the wedding supper. In a parable in Luke's Gospel, a man prepared a supper and invited all the good guests ( saved Christians ). None responded to his invitation ( they stayed with their church traditions and opinions ) so he rejected them all and chose the riff-raff instead. People say Trump is riff-raff. Is this a sign that God is leaving the righteous and turning to the riff-raff? So the wedding supper of the Lamb will be very different to what we think. It is not for faithful church members who love their church more than they love Jesus. It is for individuals who believe the revealed Word for the end time. Wine represents the stimulation of revelation. Natural wine makes one happy. But that happiness soon fades. Spiritual wine is to be made happy when you get a revelation of what a Scripture means. This deeper insight stimulates us to study the Bible more and spend more time discussing and thinking about the Word in order to get an even deeper understanding. This happiness remains and grows deeper as the mystery of the Word unfolds. Mary, as a woman, symbolizes the mother church or the apostolic church of the first church age. This first church was supposed to be the church that all later churches would be born from. All the later churches were supposed to be like the first church of the Book of Acts. As a woman Mary asks for natural wine because the supply of wine had run out. Jesus gives an answer that sounds totally out of context. In John’s Gospel Jesus is presented as the all-seeing high-flying Eagle which is a symbol of God. So Jesus looks at a local event and sees it as a symbol of a deep spiritual truth. He calls her woman. He never calls her Mother. Why not? His physical Body was entirely created by God. There was not one scrap of Mary in Jesus. Mary was just the incubator in which His Body grew. Only God is holy. He is also stating that she is not the mother of that Spirit which is within Him which worketh miracles. The foetus in Mary was holy. Thus it was entirely created by God as God alone is holy. And the Spirit of God hid inside that holy Foetus. Jesus looks at the Big Picture. The woman Mary represents the first church age church. She is asking for wine, the stimulation of revelation. But this is impossible because revelation can only be given by the Holy Spirit. The Holy Spirit in the veins of Jesus would only be released on Calvary when He died. Then it would return upon the church on the Day of Pentecost. That stimulated the disciples so much that they spoke in other tongues that different nations could understand. They staggered around like drunk men. The apostle Peter had to explain to the crowd that the disciples were not drunk on natural wine, they were simply highly stimulated by the Holy Ghost baptism which had given them a deep revelation of the Gospel plan of salvation. So when Jesus spoke to Mary, He was thinking of the Big Picture that the church would only get the stimulating spiritual wine of revelation after He had died on the cross and the Holy Ghost had descended on the Day of Pentecost. Mary, at that time, had no idea what Jesus was talking about. We must never dare say that a Scripture is unimportant just because we do not understand it. Completely baffled by His reply, nevertheless Mary knew that only Jesus could perform the miracle. She proved her faith by telling the servants to obey Him. We must always obey what the Word says we must do. Even if He tells us to do something that is very unexpected. Do not get the idea that God thinks the way we think. Do not expect God to line up with your thinking. To get ready for the supernatural transformation, the servants had to obey Jesus. If we want to be transformed into new bodies we must be careful to obey the Word. Follow a human leader and you lose out. Follow a church tradition and you lose out. Do only what the Word says. The true church, like Mary, tells the servants of God to only obey the Bible, which is Jesus in Word form. Six is the number of man. Man was created on the sixth day. Seven is the number of completion, like seven days in a week. Six is one short of completion. Man fails to be complete because of sin in his life. Six water pots puts the emphasis on man. The pots were made of stone. This symbolizes the hard-hearted attitude of man against God’s Word. We simply do not want to obey what is written in the Bible. We prefer to make up our own rules and doctrines. Adamant means a stubborn refusal to change. Before modern geologists listed the hardness of stones, adamant was thought of to be an extremely hard stone, similar to diamond which is the hardest natural substance. Zechariah says that our human hearts become unbelievably hard when we selfishly desire to reject God’s Word so that we can continue in our self will. God wrote the ten commandments on tables of stone to symbolize how hard the human heart is. II CORINTHIANS 3:3 Forasmuch as ye are manifestly declared to be the epistle of Christ ministered by us, written not with ink, but with the Spirit of the living God; not in tables of stone, but in fleshy tables of the heart. The whole salvation plan depends on two key points. First, Jesus had to pay the necessary price for our salvation. He did this perfectly at Calvary. Secondly, we have to allow Him to soften our hearts by surrendering our self will to Him. God has to do three basic steps in our to prepare us for His service. First He must save us as we accept Him as our personal Saviour. He is then our Saviour but not yet our Lord. People want Jesus to save them but He must not tell them how to dress, behave, or believe. The second step is sanctification when we surrender enough of our self will to allow Jesus to clean up our lives and make us live holy. The third step is the Holy Ghost baptism where we allow Him to fully control our lives and reveal the Scriptures to us. We then surrender our self will to Him. Only at that stage are we ready to perform God's Will. But when God uses a person and blesses that person with spiritual gifts and material success, it is almost impossible for that person not to start thinking that they are something and that they are above others. "Well, you're overdrawn so much in the bank." I put that in to fill that up. Then I find out how much it'll be approximately to live on till the next meeting. Then what's left over of that, I put it in foreign missions. That's true. For myself, I keep nothing. And most of my clothes and things are give to me. People give it to me. We live like ordinary people, when God in heaven knows I'd be a multi-millionaire if I wanted to be. But far be it from me to ever take the Gospel of Jesus Christ to commercialize it. Never in my life will I ever want to be guilty of such a thing as that. And I never want to be. One thing for a minister is money, and the next thing is immoral living, which when I was a sinner, I tried to live clean and decent. And then the next thing is popularity. Usually when God blesses a man, gives him a little ministry, he begins to think he's above everybody else. And that's just the time he's on his road out. Then comes the fourth step, the most difficult step, where we allow God to place us in His perfect Will, in His Big Picture. This will always be very different to what we planned or expected because we forget that God’s ways are not our ways. Subjection to church traditions, following a man, self-importance, the lure of wealth, the desire to be considered as clever, the herd instinct to belong to a group that produces an intense fear of rejection, and the lust for power over others, cause born again Christians to forsake the narrow Scriptural path. Thus there are very few Christians who base their beliefs purely on the King James Version of the Bible as the Absolute Word of God. It does not sound like Jesus is talking about the mega churches and big denominations or about big congregations. Purifying means cleaning up. This is symbolic of holiness. But only God is holy. So this indicates the Holy Ghost baptism that enables us to live holy lives and also clears out the unbelief in our thinking so that we can grasp the revelation of the revealed Scriptures. A firkin was a quarter of a 34 gallon barrel, thus about 9 gallons. The pots were thus of different capacity. God grants different measures of His Spirit to different people in terms of what He wants them to do for Him. If we are saved by grace through faith, that means we will not go to hell. Step one is to be saved from hell. This is essential. Having accepted Jesus as our personal Saviour, does not mean He is our Lord. We want Him to save us but He must not try to tell us how to dress and how to behave. We want to be saved and still be free to do our own thing with our elastic conscience that never convicts us. But life is not quite so easy. I CORINTHIANS 12:3 … and that no man can say that Jesus is the Lord, but by the Holy Ghost. We also need our Saviour to be our Lord. Jesus wants to be Boss of our lives, in all the details. We often fail to realize that there is a further step of salvation, not from hell, but we also need to be saved from the great Tribulation by being caught up to Heaven when the Lord Jesus comes. We need to be saved from the sleeping virgins, good women who live clean lives ( symbolizing saved churches ) but who lack oil which symbolizes the Holy Spirit. Oil produces light. Light is used to see something. Without oil they have insufficient light to read the Bible. They cannot see what the Bible means. When asked, "Why are there four Gospels?" or "Why is it that in Matthew that the women hold Jesus by the feet after His resurrection but in John's Gospel Jesus says to Mary, "Touch me not". We mask our ignorance and evade the questions by dismissing these points as unimportant. We need enough light from the Holy Ghost oil in order to see what these hidden mysteries in the Bible mean. Being saved is step one, then we need a Holy Spirit baptism where we hand control of our lives over to Jesus. We cannot work out our own salvation from hell. That is a free gift of grace which we can only accept by faith as it does not depend in any way on our good works. But what we do and believe after we have been saved from hell will affect our chances of being called to the marriage supper of the Lamb in Heaven. Like at Cana, we have to be called to the marriage supper of the Lamb. So we need to know what we are supposed to be doing and believing. At the first marriage Jesus establishes certain conditions. The six pots ( symbolizing us sinful humans ) must hold at least two or three firkins. Eighteen to twenty seven gallons is a serious amount of liquid. Only Christians who take Jesus and the Bible very seriously will make it. If you say that portions of the Bible are unimportant, or irrelevant, or not going to affect your salvation from hell then you will not be called. We are called to seek and search in the Scriptures. All Scripture is inspired and is important. So Jesus tells the servants to fill the pots to the brim. As much as they could hold. And they held a lot of water. Water is symbolic of Scripture. Believing the Bible and obeying the Word cleanses us. Only the revelation of the written Word of God can show us how to walk the way God wants us to walk. Not listening to the opinions and egotism of church leaders but rather listening to the Bible. The evidence of the Holy Spirit baptism is when He is able to reveal the mystery of the Word to a believer. The Holy Spirit performs miracles but that is secondary. His main function is to guide the church towards the truth by revealing the written Scriptures. So we must fill up our vessels with the water of the Word. Our task, just before the Second Coming of Jesus is to fill up with Scripture. Pack it into our minds and our memories. All Scripture is good and important, even if we do not understand it. Read it all and store it in your brain just like they stored up water in those pots. Then a strange thing happened. With no obvious visible signs, the water turned into wine. God suddenly, in a miraculous manner, grants you a revelation which enables you to understand the revealed Word at the end time. But He can only work on the water that is in your pot. If your pot is not full to the brim it means that you have not taken the Bible seriously and He leaves you alone. But all those who have filled their minds to the brim by learning as much of the Bible as they could and by absorbing the end time revelations of the deeper mysteries by tracking them down through the written Word. They will suddenly find their bodies transformed from mortal to immortal. Then they will be caught up to Heaven. So the water turned to wine and the important governor of the feast was impressed. The important man, the human ruler, did not know where this end time revelation came from. But the servants who were nobodies knew. The biggest weakness of Christian leadership : being the boss and ordering people around. The important guy was ignorant of what was going on, though he was in charge. The only great thing that we can do is serve, and remember that servants are not important. :44 And whosoever of you will be the chiefest, shall be servant of all. The most important Christian is the humblest servant. What can you ride on that is lower than a donkey? ( Take note Message pastors who ride in flashy cars and live in big luxury houses ). The apostles established the early church and then left the scene. Jesus then wanted no important people in the early church. He just wanted servants who carried the water of the Word to the people. The early church never had a pastor in charge of a church. The early churches were run by elders. They were there to serve, not to dominate. Important men do not know where the real wine, the stimulation of revelation, comes from as they are too busy establishing their own importance and subjecting the congregation to themselves. Jesus calls us to be servants. He does not want us to lord it over the people. The true servants are the elders who want no reputation, they merely wish to serve and obey Jesus and His Word. Paul called the elders of the city of Ephesus to the city of Miletus. :30 Also of your own selves shall men arise, speaking perverse things, to draw away disciples after them. Grievous wolves are the ministers and pastors and bishops and modern day apostles who force people to follow them. The original apostles were great. They established the early church on the basis of the written Word. Modern day self-appointed apostles no longer stay with the written Bible as they delve into the unwritten mysteries. This makes people think that they are clever, but cleverness never saved anybody. A group of elders was the proper way to run the church. No single person was to assume power over the people. Today, at the end time, there is no important ruler of a church who knows where the truth comes from. The important rulers of the churches today all rely on quotes and interpretations of quotes. If the important church leaders who rule the churches actually obeyed the Bible, then they would neither be important nor would they be rulers. Each reformer like Martin Luther or John Wesley made a big impact but years later as their followers denominated over the quotes of their leaders, so the movement deteriorated. They could maintain numbers but the quality of the movement, and its impact on the world, got worse. But the end-time mysteries, for those who take brother Branham’s quotes back to Scripture and establish his quotes by running them through the Bible, become a far better revelation of the Bible’s symbols and verses than anything that the reformers and the modern churches teach. Each reformer broke free from the denominational system of his day, which was good wine as it was a good revelation, a good inspiration that stimulated new thought about the Bible. But when the reformer died, his followers built a new denomination around his quotes and the wine deteriorated. People could no longer read and understand the Bible for themselves, they had to be subject to the restrictions and limitations of their self-appointed church leaders who focused on interpreting quotes, not Scriptures. The ignorance and errors of these puffed up leaders soured the wine. The revelation of the written mysteries that can be run through the Bible from Genesis to Revelation is the sweetest wine of all as it is the taste of eternal truth that unlocks the hidden truths that the early church once knew, but then lost in the Dark Ages. We are privileged to discover ancient truths because now those deep revelations are available. But a word of caution. We must only believe what the first church believed. If you have a belief that they never had, then you are wrong! The end time church is to be restored and not renovated. Elijah is not to bring new ideas, he is to take us back to the old ideas. Restoration means returning to a former or original condition. We must believe and act just like the early church of the New Testament. Did the early church believe what you believe? If the answer is, “No”. Then your belief is wrong. His first miracle at a wedding turned water into wine. If we can catch the revelation of the written Word from the quotes of the seventh angel, then we too will be part of the last church miracle where first our beliefs are changed to being strictly Scriptural and then our bodies will be changed so that they can move up into the air to meet Him. The disciples believed on Him. We must also believe on Him. He is the Word. We must believe and follow the revealed Word, not follow the prophet who revealed the mystery of the written Word. From a human point of view, the mother and brothers would be most important to Jesus. The disciples are mentioned last, making them the least important. Here is a deep spiritual insight. The disciples, mentioned last as being the least important, are the ones who will do the hard work of establishing the church. Mary and the brothers of Jesus, though mentioned first as being more important, will play a very minor role. Importance in the eyes of man is irrelevant to God’s work. The real work is done by the unimportant. Family connections are completely unimportant. Jesus chose outsiders for the main work, not His family. Nepotism is favouritism based on family relationship. This has always been a horrible sickness that has plagued humanity. But Jesus never stooped that low. Napoleon’s empire in Europe collapsed partly because he placed his incompetent family in power to rule over conquered countries. He was brilliant, they were not. Then came the deluge as it all collapsed. These were the sons of Joseph and Mary who were born after Jesus was born. One brother of Jesus was named James. Two disciples chosen by Jesus were each named James. These were the only two who had their fathers mentioned by Matthew. In other words the Bible is establishing that who your father is does not in any way make you important as all the other disciples were chosen without any reference to who their fathers were. So why were the fathers mentioned of the two men called James? This is a key point. The two disciples named James have their fathers mentioned to make it clear that neither of them were the brother of Jesus. So Jesus never chose any of His family as disciples. In today’s world it is common for a famous man to build up a church organization and have it taken over by his son, whose main qualification for that leadership position is the accident of his birth. The real motive is obviously the desire to keep the money in the family. The pastor and his relatives run the show. But everyone averts their gaze and pretends that this is not the case. In the Book of Genesis, three messengers came to Sodom just before the fire fell. Last century saw three outstanding ministries that stood head and shoulders above their peers. Billy Graham, claimed by many to be the greatest evangelist of the age, as the messenger to the non-Pentecostal churches. Oral Roberts with his tremendous supernatural ministry was the messenger to the Pentecostal age. William Branham, supremely gifted in the supernatural realm, was actually sent to reveal the mysteries of the written Word that the early church once believed and then lost sight of in the Dark Ages. He was the messenger to the true Bride that takes his quotes back to the Bible and proves the truth by running their beliefs through the Bible. The power of his supernatural ministry shook the world. His teachings were largely ignored. These three men were amazing. They hit the world with a real impact. As a brief personal testimony. I grew up as a hardened sinner totally uninterested in the church world. But as much as I stayed away from religion, I kept hearing about this incredibly powerful evangelist called Billy Graham. It was not just his followers who made him famous. His campaigns just spread a ripple around the world. Even a heathen like myself, far away and totally uninterested, could not help but be impressed by the effect of his ministry that I kept hearing about. Today the scene has changed. Family has taken over. The mantle went from father to son. Oral Robert’s son Richard Roberts heads the organization. Franklin Graham took over from Billy Graham. Joseph Branham took over from William Branham long after after his death and promoted his father from being the “voice of the seventh angel” to being the “Voice of God”. But the supernatural power of God that William Branham had, has faded. None of these three children have the impact that their fathers, who were called of God, had. Nepotism was the basis for securing power over the Roman empire for the first seven Roman rulers. These are the seven kings that we are warned against in Revelation Chapter 17. First was Julius Caesar, pitiless and predatory, who built up supreme power over Rome. The tyranny of his depraved family as they clung viciously to supreme power for about 100 years produced a landscape of grief, ruthlessness, intrigue, murder, and excess wealth where ugly shadows lurked as the freedom of the fearful people decayed. “One is” says John the Revelator of the paranoid sixth emperor Nero who exiled him to Patmos between 64 AD and 68 AD. The supreme power that was granted to Nero because of his family relationship with Caesar, had perverted him into a monster of nightmare proportions who instituted the first persecution of Christians. The decline in quality was ominous. We learn a harsh lesson. God’s Gospel does not run from a man of God to his son. King David could pass his political kingdom to his son Solomon. But on the spiritual side Solomon was undermined by all the wealth he collected, 666 talents of gold per year. This is the first obvious mention of the mark of the beast, which is linked to fading spirituality as people turn away from the written Word and embrace the horrible and insatiable lust for wealth. A score is twenty. Three score is sixty. Then he fell for strange women and their wrong beliefs. Spiritually this was not a good testimony. But the son Solomon impressed everyone with all the wealth that he hoarded up. Getting rich is not necessarily a sign of God's blessing. The richest men on earth are not necessarily Christians. This is the list of disciples. :4 Simon the Canaanite, and Judas Iscariot, who also betrayed him. This is ominous. The list of disciples, hand-picked, ends with Judas who betrayed Jesus, the Word. What was the downfall of Judas? His love and greediness for money. He believed in the gospel of gain. He turned away from the Word in order to make money. Turning away from the Word takes us to the mark of the beast. A subtle hint as the 666 appears in the Chapter and Verse. A harsh lesson. The love of money drives us away from Scripture. So who is the real family of Jesus? :47 Then one said unto him, Behold, thy mother and thy brethren stand without, desiring to speak with thee. :48 But he answered and said unto him that told him, Who is my mother? and who are my brethren? :49 And he stretched forth his hand toward his disciples, and said, Behold my mother and my brethren! : 50 For whosoever shall do the will of my Father which is in heaven, the same is my brother, and sister, and mother. Jesus gave no pre-eminence to His physical family. He would only live with them for a few years. His true family are the genuine believers who follow the written Bible so that they can do the revealed will of God in their appointed church age. Putting family ahead of Scripture is a disaster. You have to be totally sold out to Jesus and His Word. No family, no pastor, no human being must come between you and what the Bible teaches. After the wedding at Cana they all went to Capernaum. Capernaum means the “village of Nahum”. Nahum prophesied of the downfall of Nineveh, the capital of Assyria. Nineveh had it all as it was the capital of the world’s strongest super power. Jonah visited them and they once repented in his day. But unfortunately they did not stay that way. Then Babylon would conquer them and they would fade away. Capernaum had a similar fate. Jesus often lived here. He performed many miracles. Messiah was in their midst but the people later chose not to believe. A thousand years later Capernaum was just ruins. Capernaum was a city where many miracles would be performed during His ministry. When Jesus left Nazareth He came to live in Capernaum. This was the home of Peter, Andrew, James, and John. :16 The people which sat in darkness saw great light; and to them which sat in the region and shadow of death light is sprung up. :17 From that time Jesus began to preach, and to say, Repent: for the kingdom of heaven is at hand. So Capernaum was more or less where His ministry began. Jesus did not move to where He wanted to go. He moved to the place that was spoken of in the Bible. His whole life was lived in subjection to the written Word of God. Many miracles occurred here during His ministry. Let us consider some of them. His servant was very sick. But if Jesus just spoke the word, the servant would be healed at a distance. :15 And he touched her hand, and the fever left her: and she arose, and ministered unto them. Jesus paid all the taxes that were due, unlike many Christians today who cheat the taxman. Jesus told Peter to catch a fish that had a coin in its mouth. That coin was used to pay their taxes. Even the fish paid tithes to Jesus. They had feasted well on drowned corpses in the days of the Flood of Noah. They owed Him. :22 And they were astonished at his doctrine: for he taught them as one that had authority, and not as the scribes. Jesus taught them truth and then cast an unclean demon out of a man. A huge crowd packed around Him. A paralysed man needing healing was lowered down through the roof. Then one day as they came towards Capernaum, each disciple began to try to prove that he was more important than the others. Just like today's pastors and church leaders. "I am in charge. I am more important than you. I am an apostle. I am a bishop. I am top dog. Admire me. Envy me. Hero worship me." Pride and self-glorification are a sickness that penetrates deep into the hearts of us human beings. Among themselves they argued who was greatest. In the presence of Jesus they kept very quiet. Compared to Him they realized they were nothing. We humans must not compare ourselves to each other because then we become puffed up and run other people down. It is healthier to compare ourselves to Jesus because then we are aware that we are simply unprofitable servants. The endless curse of self-obsession. I am better than you. Disciples who think themselves to be superior have missed the purpose of their calling. While in Capernaum the problem of sectarianism arose. My church is better than your church. The next curse of self-obsession is that only my group is right. This guy should be silenced because he does not follow me or belong to my group. There can only be one church in a city, my church. If you do not follow me, you are lost. A pastor’s motto: everyone is entitled to my opinion. The fame of the many miracles done in Capernaum had spread around. When Elijah the prophet needed a place to stay, God sent him to a Gentile home not to a Jewish home. This is a subtle reminder that when the Jews do not appreciate what God has done, God will then turn to the Gentiles. So despite the fame of all the miracles done to the Jews in Capernaum, Jesus reminds them that if they do not believe in Him then God is happy to turn to the Gentiles if need be. Jesus here reveals a grim warning. All the miracles done in Capernaum will not stop their unbelief and will not prevent the descent of these Jews into hell. Witnessing the supernatural exalted the people of Capernaum into the heavenly realms but this does not necessarily make one a believer. :17 And the seventy returned again with joy, saying, Lord, even the devils are subject unto us through thy name. :20 Notwithstanding in this rejoice not, that the spirits are subject unto you; but rather rejoice, because your names are written in heaven. Being able to manifest and demonstrate the supernatural does not make one a believer. Our names must be written in Heaven in the Lamb’s Book of Life. This is a record of those who believe the revealed written Word for their day. :22 Many will say to me in that day, Lord, Lord, have we not prophesied in thy name? and in thy name have cast out devils? and in thy name done many wonderful works? Displaying the supernatural is not the evidence of being right with God. Caiaphas and Balaam were both evil men, but they both made a true prophecy. MATTHEW 5:45 … for he maketh his sun to rise on the evil and on the good, and sendeth rain on the just and on the unjust. God blesses people who believe truth and people who believe error. So the fact that God blesses you does not mean that you are believing the truth. Again, Jesus performs a long range miracle from Cana that heals a nobleman’s son in Capernaum. As they sailed towards Capernaum, Jesus walked on the water to meet them in a storm. This was one of His greatest supernatural feats. When they got to Capernaum, Jesus then decided to put them to the acid test. They had seen much of the supernatural at Capernaum. Now He decided to let them hear some tough teaching. :60 Many therefore of his disciples, when they had heard this, said, This is an hard saying; who can hear it? :61 When Jesus knew in himself that his disciples murmured at it, he said unto them, Doth this offend you? Preaching the truth from Scripture chases away the people who are attracted by the supernatural. Believers who over emphasize the supernatural seem to be unable to stay with the written Bible and deviate off into their own clever speculations that are little more than froth and bubbles. :21 Woe unto thee, Chorazin! woe unto thee, Bethsaida! Capernaum was spiritually exalted to see incredible supernatural miracles and to hear deep, Scriptural teaching. People were impressed by the supernatural but had no desire to be Scriptural in what they believed. :24 For I tell you, that many prophets and kings have desired to see those things which ye see, and have not seen them; and to hear those things which ye hear, and have not heard them. Old Testament saints who saw the future in visions would have loved to see Messiah in action. But the people of Capernaum were not really changed by the power of the supernatural and thus rejected the deeper teachings of Jesus. The Word of the age passed through their midst and they were too preoccupied with their own lives to notice. They had it all, but let it slip through their fingers. Rejecting what God is doing in your day is a dangerous attitude. Old Testament saints wished that they could understand the mysteries that Jesus was talking about. The revelation of the mysteries of Scripture made the disciples "blessed". Today, God is revealing the hidden mysteries that the early church once knew. If we fail to realize how privileged we are to see such truths, then God will not be interested in us because we are not interested in what He is finally revealing. His thinking that is revealed in the Bible should fascinate us. But we seem prefer the ignorance and limitations of our pastor-dominated churches that leaves so much of the written Bible unexplained. This concludes a brief summary of some of the recorded miracles and events that would happen in Capernaum during the ministry of Jesus. Going back to the start of His ministry. Jesus left Cana and went to His hometown of Capernaum. Knowing that all the supernatural miracles in Capernaum would not produce many genuine believers in God’s Word, Jesus chose to cut His stay there short. In a sense Jesus was saying that the supernatural in Capernaum did not achieve its main goal because it never removed their unbelief that stopped them from believing the Word. The supernatural benefited individuals but did not encourage people to be Scriptural. The supernatural was the style but the Word that He spoke was the substance. Style is not as important as substance. From this we learn that the supernatural attracts attention but does not hold the attention of the person for long enough to make them a keen student of the Bible. Great and impressive though the supernatural is, it only induces a superficial attention to the Bible that skims the surface. Impressive supernatural displays stimulate the emotions but often do not give people the motivation to study the Bible, leaving them mostly Bible-illiterate. These are low grade converts, if they are converts. But if it is a keen interest in the written Bible that attracts a person, despite everything else that may go wrong, then that person will be held permanently by the fascination of the revelation of the written mysteries. God's way of thinking is so brilliant to that person's mind that he or she is just completely hooked on God's Big Picture. The stunning overview of thousands of years of human history that are controlled and predicted despite the complications and flaws of human self-will are mesmerizing. These people fall in love with an awesome Intellect that is far above and beyond human imagination. They simply want to know more and be part of the great climax of human history. The disciples became fishers of men. The supernatural is a bait that attracts small fish near the surface. The revelation of the written Word is a bait that attracts big fish who swim in deep currents. The small fish are the sleeping virgin who are impressed with supernatural show-offs, musical entertainment, and classy showmanship. They believe some of the Word that is easy to understand and ignore the rest that requires hard thinking. They have too little oil to produce enough light to read the Bible with. So they cannot see or understand what is written. The big fish that swim in the deep, hidden currents are the Bride. They are the real believers in all of the written Scriptures. They enjoy the hard thinking. The challenge stimulates them as if it is good wine. They have enough oil to make a bright enough light so that they can read the written Word and see what it means. Their stimulation comes from joining the written Scriptures together so that God's great plan for their day can be revealed for their guidance. Jesus now heads for Jerusalem. He was the Lord. He had to come to the Temple. Thus it was written. He wanted to celebrate the Passover in the Temple as He followed all the Jewish festivals. He lived by the Law in order to set us free from the curse of the Law. Then one thing made Him cross. Men who used religion in their insatiable greed to make money. Spiritual blood suckers. A cord is a thin piece of woven string. A few of these cords will make an effective whip. That is what Jesus used at His first Coming. At the end time, the far more numerous religious money makers who miss out on His second Coming will be killed in the Tribulation. For them, the many cords will symbolize a hangman's noose. He physically threw the men out of the Temple and disgustedly poured their ill-gotten money onto the floor. What provoked the wrath of Christ was men getting rich as they claimed to serve God. They had items for sale. Just like today's churches. Every TV half hour program ends with the sale of a book or a CD or DVD. The one constant in each program is the final pull for money. When we look at today’s wealthy pastors with their big houses and bank balances we see the same greedy spirit that made Jesus so angry. When He returns there will be many rich church leaders who are thrown into the great Tribulation. This Scripture covers our modern day pastors and church leaders. Bishops. Apostles. Archbishops. Cardinals. Popes. Woe sounds like the great Tribulation. It certainly does not sound like the wedding feast in Heaven. In a society overrun by commercial clutter, religion has become yet another product sold in the consumer marketplace. There is no mention of what Jesus taught in the Temple, just his condemnation of those who got rich from their religious duties. His zeal for the Temple was directed towards getting rid of those who served God for profit. Business is based on creating a product that religious consumers will buy. They will change the product to suit the market. Mega churches offer "religion lite" as a watered down product that sells easily because it offends no-one. Their religion is a product subject to the whims and changes of the market. They want to sell the product so they are not too concerned about modifying the Bible beliefs. Sales are more important than substance. One critic claims that mega churches feed easy-to-digest "junk food" to the already spiritually overweight. To them their spiritual experiences are far more important than doctrine. Marketing consultants claim that people come back for more if you offer them stress reduction rather than salvation. It is about feeling good rather than being good. This rakes in the money. The pursuit of profit requires that you provide what people want not what they need, so as to have a bigger audience. With every broadcast there is segment devoted to soliciting funds and selling of religious or spiritual merchandise. Business is built on marketing brand names like Apple, Google, and Coke. The Roman church made Saint Peter the doorkeeper of Heaven and Mary as the sympathetic mother that you can always pray to. Mother Theresa and Pope Francis give them two highly respected icons. Now daughter churches are climbing on the "brand name" bandwagon. Joel Osteen, Joseph Prince, Oprah Winfrey, and TD Jakes have become multi-million dollar organizations built on these famous names. Jesus knew that despite the fact that He lived in poverty His church would grow into a multi-multi-billion dollar business. Claiming to be preoccupied with the riches of Heaven, the church in reality has become one of the most formidable accumulators of the riches of earth. The Roman Catholic church alone controls about one third of the total wealth of Europe and America. Jesus threw out the money makers. He became really angry. What was He showing us when He threw the religious financial fat cats out of the Temple of God? Where is the Temple of God today? I CORINTHIANS 3:16 Know ye not that ye are the temple of God, and that the Spirit of God dwelleth in you? This has a double meaning. God puts His Holy Spirit into the hearts of born again people and then He expects them to live holy lives, or else! This involves each single person as a living stone in the Temple of God. Then all the born again Christians over the 2 000 years of church history collectively form the vast spiritual Body of Christ or Temple of the living God. So Jesus was telling us that He would take all the church leaders who had polluted His spiritual Body or Temple, the true church, by turning it into a sordid money-making racket and Jesus would throw them out of His spiritual Temple. They will never be part of His Bride. They will never be caught up to Heaven when He comes again. Their immediate future is the great Tribulation. Being rich does not get you closer to God. Jesus had just wrecked their lucrative money making racket. They were so mad at His interference that was costing them money that they would eventually conspire to kill Him. There was a distant threat in their attitude. They had so much religious power and political power with the Romans that they could arrange to have Him killed if He kept interfering with their income. That is what they could do to Him. The next time, three years later, that He threw the money lenders out, they would arrange to have Him killed. What sign could He show to scare them? He told them of the greatest sign of all, the resurrection from the dead. Sure they could arrange with the Romans to have Him killed, but He would rise again from the dead. The Jews had no clue what He was talking about. The Temple was the centre of their religious racketeering and greedy money making. Their pay packets depended on the Temple. But they only had about 40 years left before it was their turn. Then the Temple and over a million Jews would be destroyed by the Romans. The Jews would never be able to raise up their Temple again. Herod began rebuilding the Temple around 20 BC, making it bigger and better. Thus it was completed by 26 AD, although some finishing touches continued to 63 AD. So when Jesus attended His first Passover in the year 30 AD, the Temple had only been reasonably completed for about four years. It was virtually a brand new and magnificent building that the Jews were very proud of. But that same Herod had killed the Jewish children up to the age of two years when he tried to destroy Jesus. Herod failed in that attempt. But the Temple he built at great personal expense was doomed to be destroyed in AD 70. Jesus had no interest in rebuilding the Temple. Temple worship would cease when He died because God tore up the Temple veil. Then the Temple would be destroyed and never rebuilt. The Temple, as the centre piece of the Jewish Law was about to become redundant, replaced by the New Testament Gospel of Grace where the centre piece is Christ crucified on the cross. But the goal of Jesus was to die and resurrect from the dead. The Temple of His body would be destroyed by the Roman crucifixion, but that bodily Temple would rise again at His resurrection from the dead. So Jesus would do what the Jewish Temple could not do. Be destroyed by the Romans and then come back to life again. These Temple Jews and money makers would eventually demand His death and then refuse to believe in His resurrection. They in turn would be killed in AD 70 when the Romans killed 1 100 000 Jews in Jerusalem. This was the first Holocaust of the Jews. The price they paid for killing Messiah. Their Temple was destroyed and never rebuilt. The Temple Jews thought that they could kill Him. They had no idea what they were heaping on their own heads. Today, both they and their Temple are dead and gone. Meanwhile Jesus is alive and well today. So there was a sign that Jesus left them. His power to resurrect from a brutal Roman death which neither they nor their Temple could achieve. The only problem is that the awful religion-for-profit spirit which they had would continue on and flourish in the end time church. These money making leaders will be thrown out into the Tribulation. It was only after the resurrection of Jesus that the disciples began to understand the whole Gospel plan. Their Scripture was the Old Testament. The words of Jesus were written down as part of the New Testament. Everything that Jesus said and did would link the Old Testament with the new Testament. The miracles attracted many people but Jesus was not too impressed. He wanted people to believe the Scripture, not just the supernatural signs. Believing the Bible truths and being impressed with these revelations requires a much deeper relationship with God than being impressed with the supernatural. Crafty enemies can profess to be sincere followers. False friends who seek their own advantage. Faith based on the supernatural can easily become superficial as it stirs up the emotions. People can become sign-seekers, rather than Scripture-seekers. We can bluff others but we cannot bluff God. The same men who cheered Him on Palm Sunday when He rode in on a donkey were the same people who demanded His crucifixion on the following Friday. Praise turned to hatred within a week. These Jews were so used to following their religious leaders that they could not think for themselves. They would condemn their own Messiah because that is what their religious leaders told them to do. They simply stopped thinking for themselves and followed the herd. Typical of today’s Christians. But if you follow the herd you eat dust. Dust is the food of the serpent. Reasonably ignorant of the Bible, fearful of disagreeing with the church leader, and terrified of not being part of the church. This is the state of modern Christians who cannot give an opinion by themselves as they are forced to rattle off the official church doctrine. This is a hazardous process as today there are 45 000 different denominations, that all claim to be correct. Your church has a one in 45 000 chance of being right. That basically means no chance at all. All ten virgins ( good saved churches ) were fast asleep in the parable. Unfortunately the later churches chose to follow the man-made traditions of the Roman Catholic church, which calls herself the mother church, instead of the New Testament church. They put a pastor in charge of a church although this was never done in the New Testament where the word “pastor” is only mentioned once. He does the thinking for them and they are scared to disagree with him. Each person polishes up their own self-image to impress others. But when Jesus stood in the judgement hall of Pontius Pilate then everyone who was in the hall condemned Him and no-one supported Him. Such is the uselessness of us humans. We easily fail when the going gets very tough. Jesus is the Word of God. When the whole world criticizes what is written in the Bible, are we prepared to endure the mockery and persecution that comes from standing up for the written Word. Even Simon of Cyrene only helped Jesus carry the cross because he was forced to do so. How well do we stand when all the world turns against Bible truth? When all the world rejects the King James Version of the Bible?